Red dot sights are one of the most popular sight options on modern weapons – offering both accuracy and speed of target acquisition. But like any battery-powered item, they can fail, so it’s wise to consider backup iron sights as added insurance. Now – if you’re going to have two different sighting systems on your weapon, you’ll want to make sure they work harmoniously with each other. This is where “co-witnessing” comes into play. Note: This article is focused on AR-15 setups that use red dot sights and backup irons, since this is the most popular configuration we see. But the concepts apply to any weapon where iron sights are used along with an optic. Simply put – co-witness refers to the alignment of your iron sights with your red dot sights. If your irons and your optics are both sighted in, you would expect them to be aligned (co-witnessed) with each other when you line up your shot. This is the basic concept, but in reality it’s a bit more complicated, because there are different varieties of cowitness that you can use. On AR’s, the two most common cowitness types are – “absolute cowitness” and “lower 1/3 cowitness“. 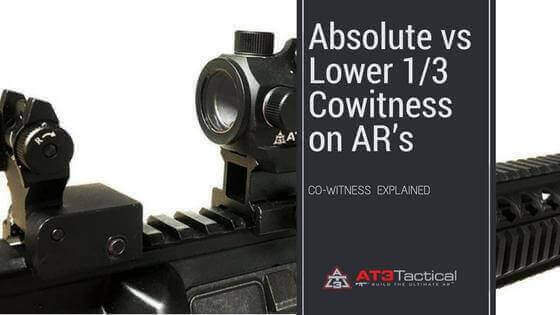 The graphic above shows the difference between absolute and lower 1/3 cowitness on AR’s with both optics and iron sights. The way you control your type of co-witness is with the height of your optic. Many red dot sights use riser mounts for this purpose – for example the AT3 RD-50 PRO red dot sight gives you a choice of mount heights. There are advantages and disadvantages of each type of cowitness, which we break down in the chart below. **The further your optic gets from the bore (center of barrel), the more difficult it is to sight-in correctly at a variety of distances (more variance between short-range and long-range point of impact). Luckily the difference between absolute and lower 1/3 setups is so minimal that’s barely noticeable. But it’s still worth mentioning. So which setup is best for you? Keep in mind that either setup will work, so this really boils down to personal preference. If you have fixed iron sights – we recommend lower 1/3 cowitness. This will give you an uncluttered view of the red dot, but you can still drop your line of sight to use the iron sights if needed. If you don’t have iron sights – cowitness doesn’t technically apply, but when choosing the mount for your red-dot sight, go with an absolute cowitness setup, because it will put the optic at the “standard height” that the AR-15 was designed for. Hey Hugh, I would recommend running it without a riser on the mini-14, that’s how most people tend to run red dots on those. If you have any more questions, let us know! Thank you for a easy to understand, but fully informative article. Sound advice! co-witness, which would you recommend for use on a flat top using HK iron sights? Good Article, and well written for the AR Newbie and those considering eith a Red Dot or Iron Sights. The diagrams you supplied gave a good visual representation as well. Having the Pros and Cons of each type of system is a big help. What would the formula be for a carbine with an a2 carry handle?